The KLAW Cryobreak Breakaway Coupling minimises the risk of cryogenic media spills; this reduces the risk of both damage to assets and injury to personnel in the event of a drive-off or extreme pressure flow. Minimum headloss – reduces impact on your general operation. Compact and lightweight – enables easy handling and moving of the coupling. Simple to operate and maintain – each unit is supplied with a detailed Installation and Maintenance Manual. The KLAW Cryobreak takes advantage of KLAW Flip-Flap Valve and Breakstud technology. 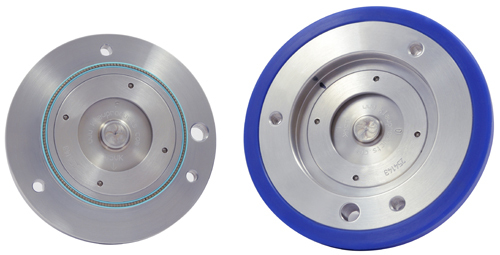 KLAW Flip-Flap Valve technology eliminates the risk of Partial Break – activation and therefore flow closure can be instigated with a single Breakstud release. 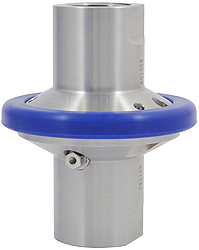 100% instantaneous closure of both upstream and downstream flow – minimizes the risk of spills and clean-up costs. Shown Flip-Flap Valves within the two separated halves in the activated and closed position. Designed and manufactured for the safe transfer of media at cryogenic temperatures. More simple to maintain: Reset plugs with easy to reset procedure after maintenance or activation. ATEX cable is fitted as standard. No need for separate end connectors; but maintains the flexibility of multiple End Connections. Wrench spanner Flats included in the design for easy threaded end attachment. Option to include proximity switch to monitor transfer operations. Large scale and small scale Ship Bunkering, Ship-to-Shore operations, Road Tanker refuelling and Bulk Storage, Fixed Bulk Storage operations, Rail Car Tender Cars, Loading Arm installations and retail dispense equipment for cryogenic service. Road Tanker drive-off prior to disconnection. Shift or shunt of Rail Cars during loading or unloading operations. Over pressurisation of the transfer system beyond the engineered tolerance of the Breakstuds. Coupling break-loads can be varied to suit any particular application. 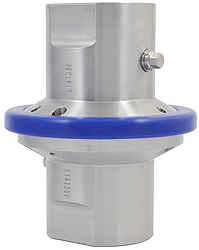 This Cryogenic Breakaway Coupling is designed to activate under a bending moment. The applied force being an angle of up to 90 degrees to the plane of the coupling. 1” weight: 1.8kg length: 119mm. 2” weight: 6.3kg length: 201mm. End connections: Threaded Female, Flanged and Weld prepared. Other connections available on request.